This is the second Pachai Payaru Masiyal recipe (earlier recipe here ). The difference in this recipe is that it uses sambar powder. This style is prepared in the villages mostly. It is very tasty and goes well with Chappathis. 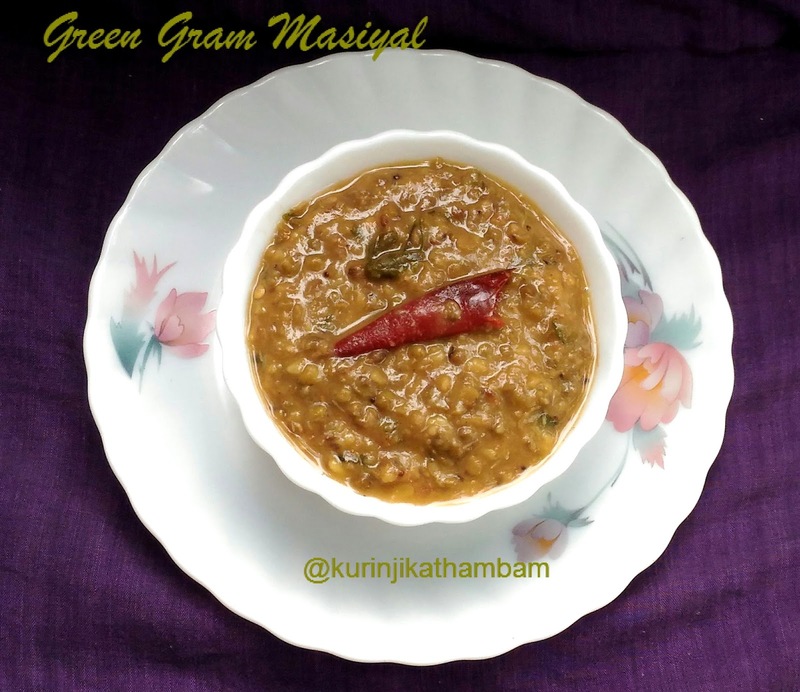 Click here to view more Green Gram Recipes. 1. Wash the green gram and keep it aside. 2. Wash and cut the tomato into small cubes. Wash and chop the onions and garlic pods into small pieces. 3. 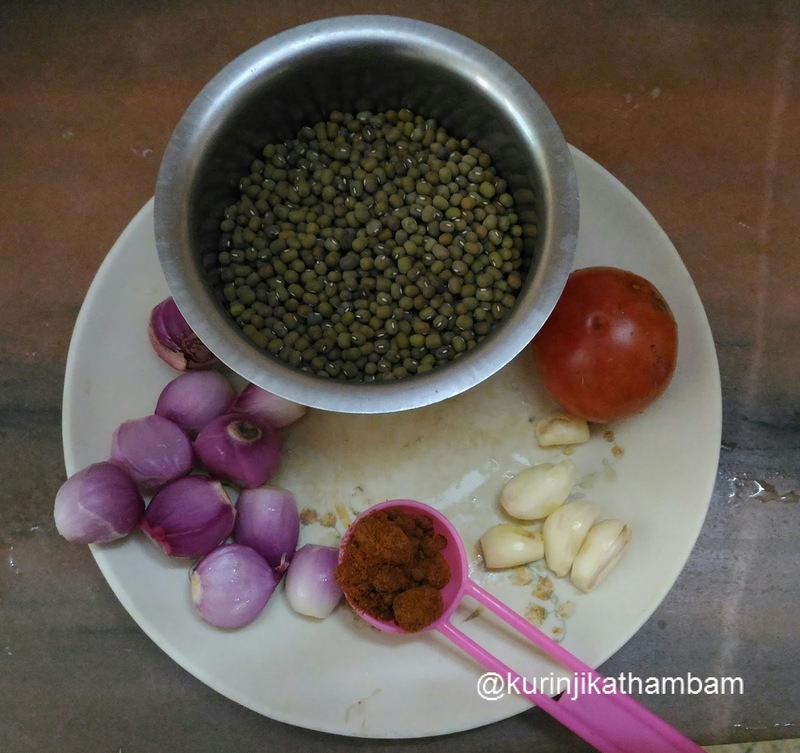 Add washed dal, tomato cubes, chopped onions, chopped garlic pods, sambar powder and salt in a pressure cooker. 4. Then add 1 cup of water and castor oil. Mix them well. 5. Pressure cook them for 3-4 whistles in a medium flame or till the dal becomes tender. 6. Heat the oil in a pan, add mustard seeds, cumin seeds and wait for splutter. 7. Then add the curry leaves and broken red chilli. Fry till the curry leaves becomes crisp. 8. After pressure has gone, add this temper (from 7) and close the lid of the cooker and cook for 5 mins. 9. Then garnish with chopped coriander leaves. 10. Finally, mash this dal mixture with hand blender or electric blender. 1. Dry roast the dal till nice aroma comes out from the dal. Then allow it to cool down completely and then use. You can use raw dal also. 2. 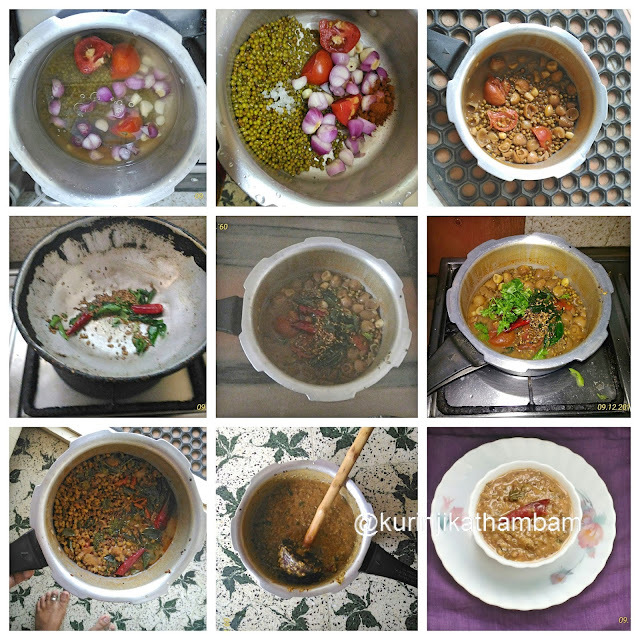 Adjust the water level according to the dal consistency.